Sri Sai Translations (SST) was founded in 2008 by Sangamesh Bhure president and accredited simultaneous translator & Sushmita Bhure interpreter in linguistics. Their Mission was to become leaders in language service industry by delivering top-quality language solutions to a broad base of clients, including all segments of india and major global players. At SST, the key to our success has been the calibre of our team and our dedication to our clients. 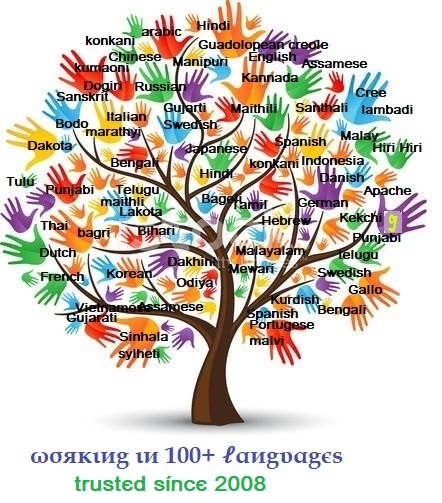 Our network consists of a full time staff of over 350 in-house linguists and project management executives, as well as a network of over 800+ certified language specialists. Our staffs is committed to delivering a translation/interpretation that truly reflects the concepts, thought and register of the source material, and they are on call around the clock to meet the most critical project demands with utmost consistency. One client requested quotes from three translation companies for translating about 2,70,000 words of supply chain user guides from English to Hindi. Along with the new user guide that the client needed to translate, the client also gave us the old user guide in English and Hindi. - Save our customer money. Our Client immediately accepted the quote, why? None of the other translation companies created a translation memory from previous translations. Just by doing careful analysis and preparation of the project, and being with the client that their translations can be re-used, we undercut their quotes by about 1, 00,000 INR. We know good translations are expensive. That’s why we save our customers money in any way we can. Can we save for you? Helping the translation of a poster child of customer generated content keep up with rapid readership growth around the world!! Sri Sai Translations helped to established a automated, custom localization process for a ongoing cast savings projects and triphled global readership in seven language markets within the first year.